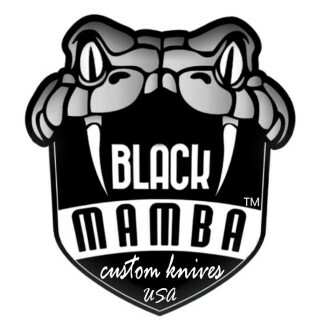 Black Mamba knives is a Limited mid sized business with a big reputation. Custom, handmade knives for any hunt, fishing or camping trip. Custom made knives that fit your needs! Forging is the art of shaping metal using localized compressive forces. we use a blacksmithing hammer and manpower to mold the steel into the shape of a blade. When we hammer forge, we not limited to the width of the stock and there is less waste during the original shaping process. we then use a stock removal technique to form the knife blade angle on my hand made knives. we intentionally prefer to leave these hammer marks into the blade so that the owner can see a sense of uniqueness and craftsmanship involved in its creation. However all of our hand forged, custom made knives can be designed without these marks at the request of the buyer. Because of the hand forged process every custom blade is an artisanal creation custom hammered out a hot bar of steel then heat treated to produce a handmade knife of superior quality and character. we spare no expense when selecting the materials to make my knives. we strive to provide all of my customers with a superior quality item, which can be enjoyed for years. My primary steels Is Damascus steel but not limited to,we also use D2 and a variety of Damascus and variety of stainless steel 440c , high carbon steel titanium steel and soo on,Will use others at customers request. My blades are heat treated to give optimum performance. we use a wide variety of handle material, our preference being Stabilized Burls, Stag, Sheep Horn, Buffalo horn , camle bones, dye bones, Woods, stabilized resin handles, turtle shells , pearl shells. Mammoth Ivory and many other. Handles are custom designed to fit the style and purpose of each knife. When you purchase one of our knives, you will know that you own a knife which was made by someone who takes great pride in his work, creating the knife out of raw materials. Each knife is individually handcrafted and we strive for superior quality in each knife we make. If you don’t see exactly what you had in mind, let’s talk, chances are we can make it for you. every day we are available please write a email to us..